Beautiful shot of the anemone! I've just discovered your meme blog! Will try to participate soon! Your contributions will be most welcome, Mildred! That's a very nice shade of red! My first time to link. I've never been able to grow anemones successfully, but I appreciate the efforts of those who can! Those anemones [say that in a hurry :-)] will have straightened up by now. A beautiful anemone! We used to grow a variety of them when we had our house (and garden) in Oregon. And it is also the name of a sea-creature that we see in tidepools off the Oregon Coast. Thank you for doing the meme!! Beautiful flower of the bright red color. I did not know that about the name of the flower....very interesting!!! And your image is stunning...love the color. Hi Nick, I use photoshop and use the photomerge function. I have the older version CS2. Welcome back, Helene! Always a pleasure to have you contributing! are they wild? I must look out for them. 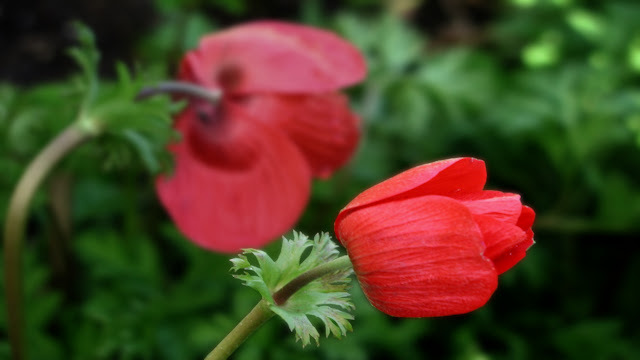 Very nice capture of the red anemones Nick. I like them very much. Carole, your link does not work, please re-link!